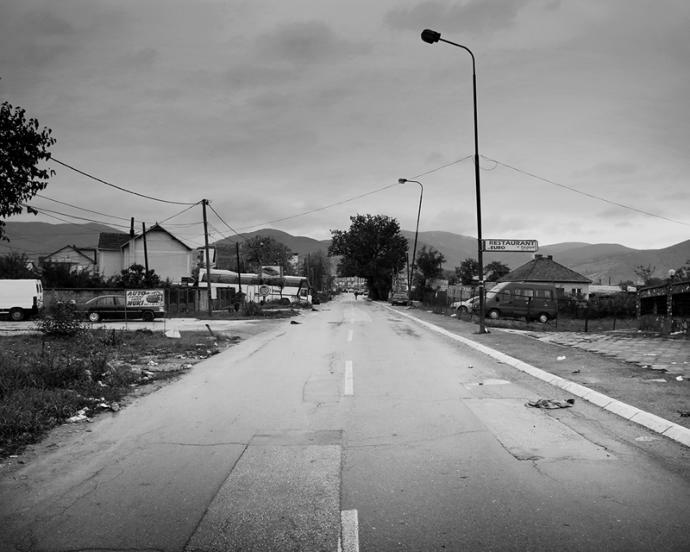 This work documents the situation I found in Preševo (a small town near the border with Macedonia, in the province of Pčinja, Southern Serbia) during the first days of October 2015. The day I arrived, it was raining and continued to rain incessantly in the following days too. People waited in a long queue for several hours, tired and hungry, with their feet in the mud and their luggage in tow, before entering the camp. The only protection, provided by the few NGOs present, were ponchos and plastic sheets that covered the line here and there, while a lucky few took shelter under their umbrellas. The flow of people was almost continuous, with sometimes up to ten thousand refugees arriving a day. Everything took place along a suburban street in this little village, near the train station. A road about one kilometre in length, was a place of arriving and departure, a limbo, in which refugees spent a few days being identified and registered. Coming from the nearby crossing border, some arrived on foot, some by bus, from Miratovac. The flow of people down the street was controlled by the police. 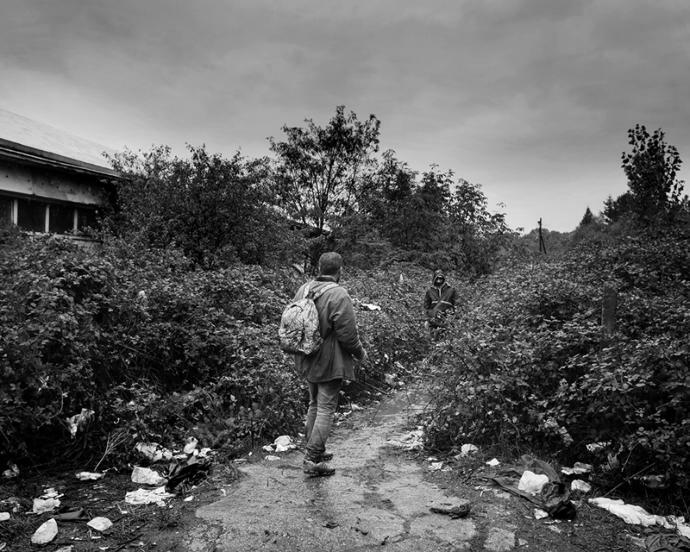 They walked along the street towards the camp, where they waited for a permission card to leave Serbia (within a time frame of 72 hours, after which they were obliged to apply for asylum in Serbia). With a permission card they then waited for transport to the Croatian border. The Camp, only for identification and registration purposes and for medical assistance if needed, was being managed by Doctors Without Borders and the Red Cross of Serbia, the officers of UNHCR, together with the Ministry of Internal Affairs of Serbia. 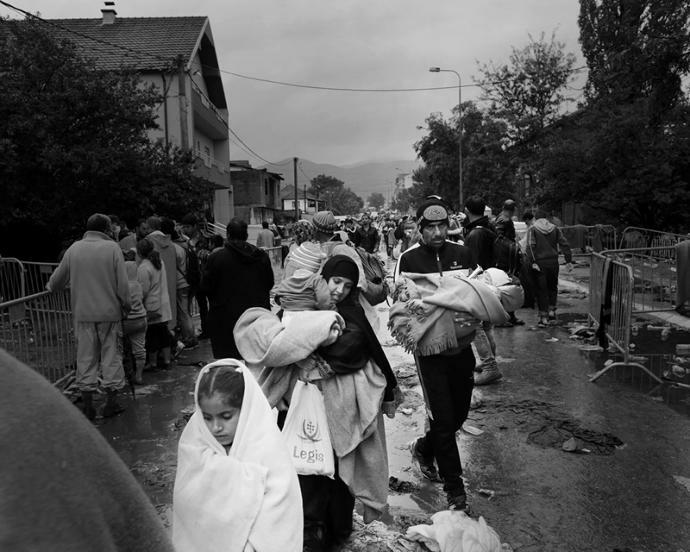 The residents of Preševo reacted to the incoming refugees by making money out of the crisis. The refugees, were not given food, water or tents by the institutions on arrival. They had to buy everything on site and so a little town, within a town had sprung up with businesses selling supplies. 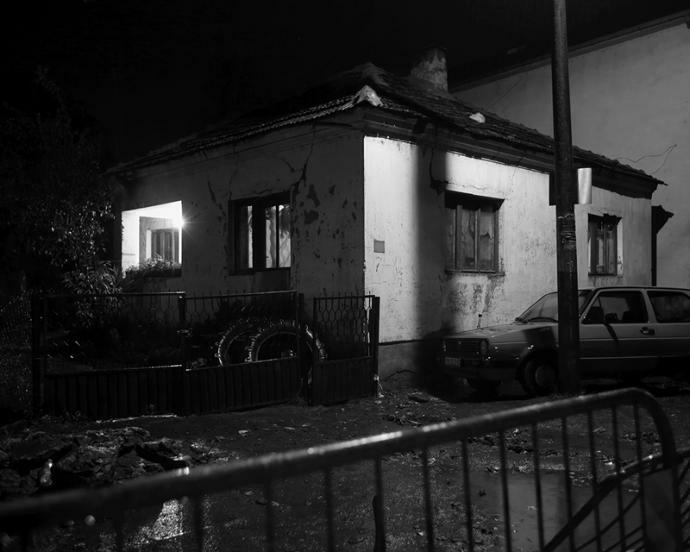 Those without their own tents, spent the night in makeshift shelters in basements of houses under construction, or in rooms offered illegally by the residents for a fee (it is against Serbian law to receive refugees without permission). 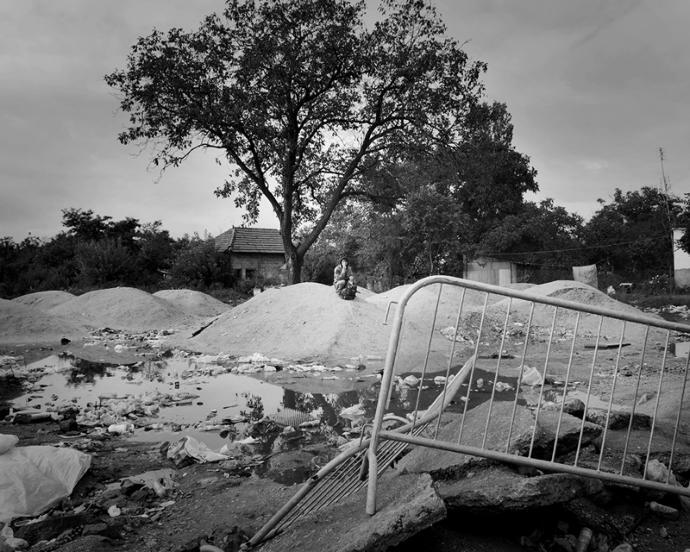 Those without money, lay down to sleep on plastic sheets on the ground. There were attempts being made to prevent refugees from being taken advantage of by local criminal gangs who were offering illegal transportation of persons without permission cards to Sid or Belgrade, for astronomical fares; or who were selling fake permission cards to leave Serbia at 20€ each. Presevo, Pčinja. Serbia 8th Oct 2015 This is the road where the camp is located and where everything happens. The refugees reach this road by bus or walking, coming from Miratovac, after they have crossed the border with Macedonia entering Serbia. Presevo, Pčinja. Serbia 9th Oct 2015 An Afghan refugee, getting a rest in front of the queue, eating and looking at it. Often people travel completely alone, and lost. Presevo, Pčinja. 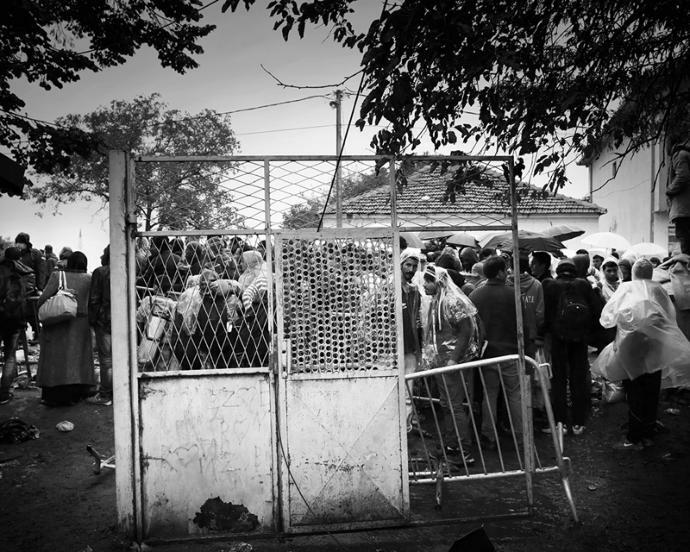 Serbia 7th Oct 2015 A group of refugees standing in the queue, waiting to enter the registration camp, managed by UNHCR and Serbian Ministry of internal affairs, where they receive the permission card to leave Serbia within 72h. Presevo, Pčinja. Serbia 8th Oct 2015 A part of the queue, standing under heavy rain (seen from an abandoned place behind what remains of a gate that refugees opened to have free access to this zone) finding a place to set tents or a temporary shelter. Presevo, Pčinja. 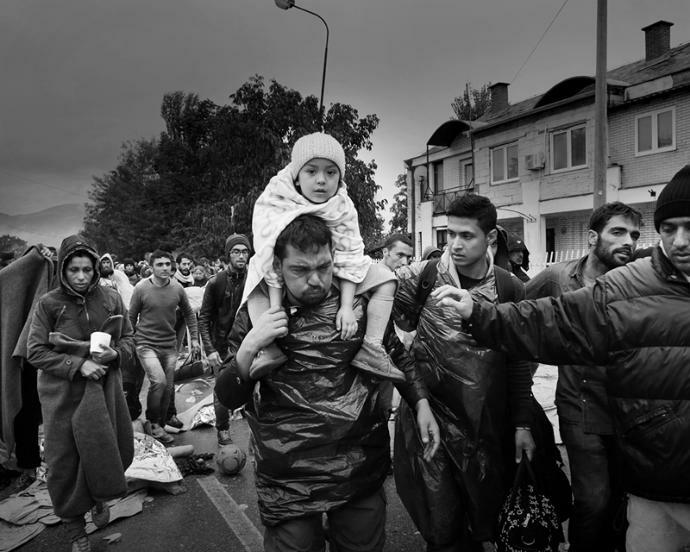 Serbia 9th Oct 2015 A father with his son, trying to pass the block of the police with people pushing behind him. Each compartment of the queue, is controlled by the police and army that try to stop refugees from forcing the fences. Presevo, Pčinja. 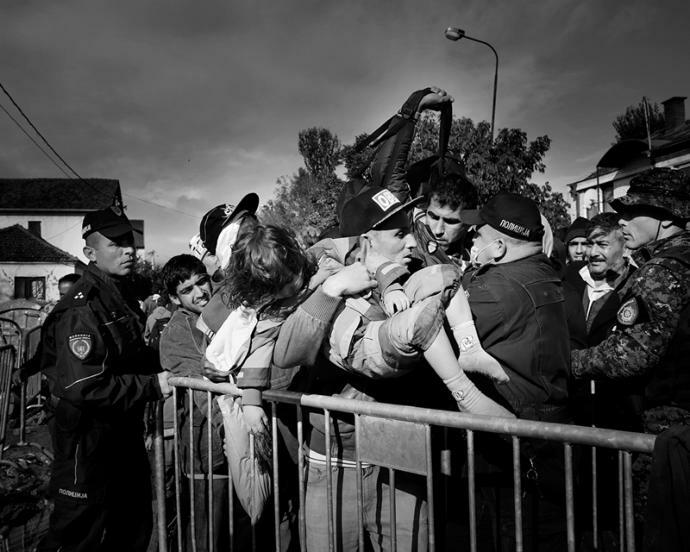 Serbia 8th Oct 2015 Two refugees try to go through a hidden passage, to enter in the registration camp from the back, escaping from the exhausting waiting line. Presevo, Pčinja. 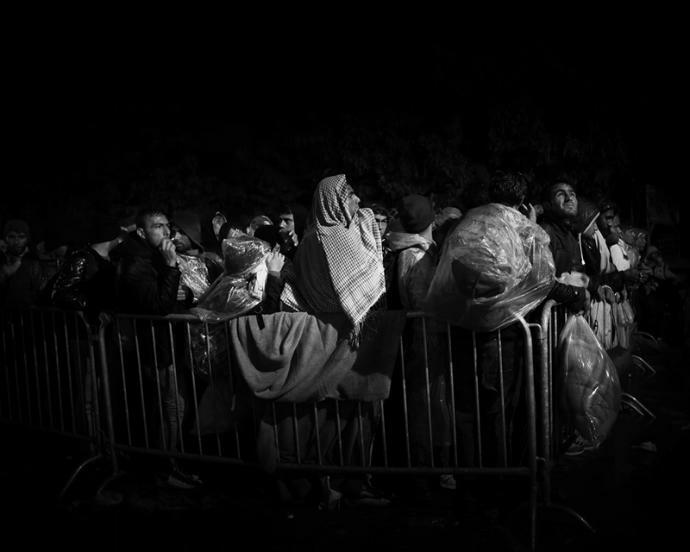 Serbia 8th Oct 2015 A syrian father with his daughter and other family members, with the rest of the queue behind, moves from one compartment to the next, inside the line, always contained by fences for the entire length of the queue. Presevo, Pčinja. 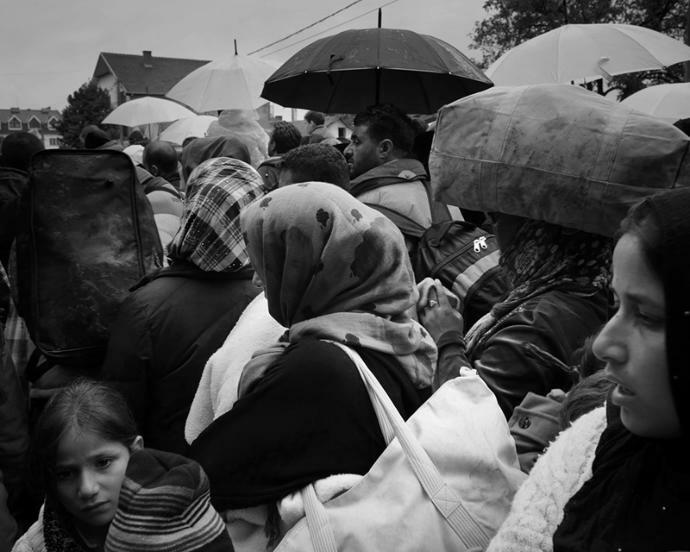 Serbia 8th Oct 2015 Three different generations of women, in the rain, waiting to enter the camp. In the queue there are entire families with women, children and elders. Families try not to get separated. Presevo, Pčinja. 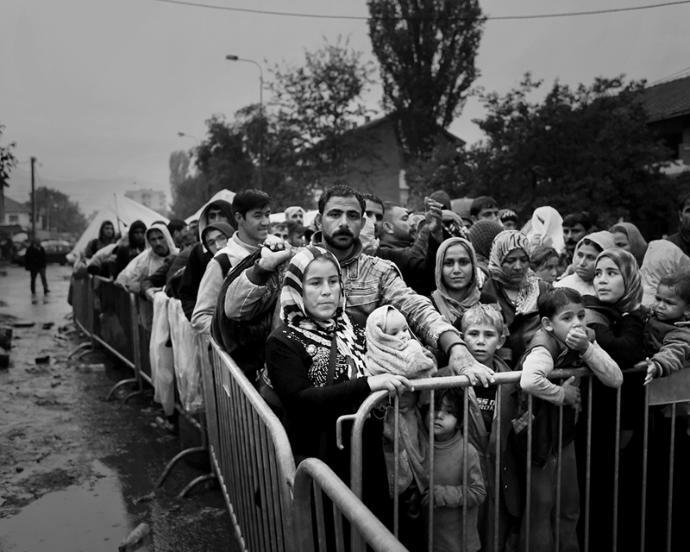 Serbia 8th Oct 2015 A family reaching the end of the queue. Presevo, Pčinja. Serbia 7th Oct 2015 Most of the locals, stay in their houses avoiding contact with refugees, apart from those who run a little business, like bars, restaurants, bakeries, or supply shops. Presevo, Pčinja. 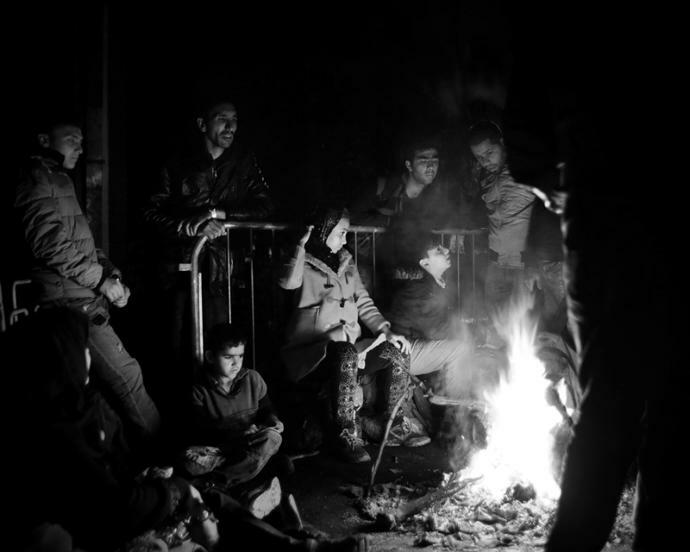 Serbia 8th Oct 2015 A group of refugees warm up around a fire lit on the roadside, while the queue continues and other people prepare themselves for the night. Presevo, Pčinja. Serbia 7th Oct 2015 The queue in the evening. The waiting line can last more then 24h and it's recommended not to leave the queue, even to get food, in order not to lose your position in the line. Presevo, Pčinja. 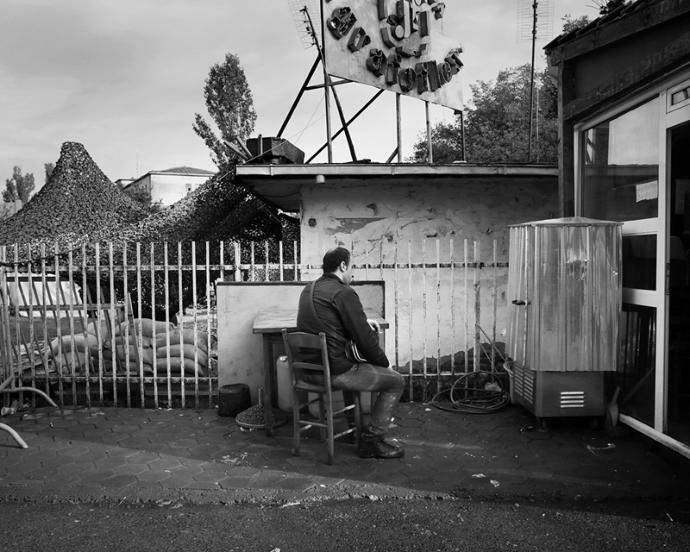 Serbia 9th Oct 2015 A refugee sitting with his thoughts, outside a local bar in front of the registration camp, after having received his permission card. Presevo, Pčinja. 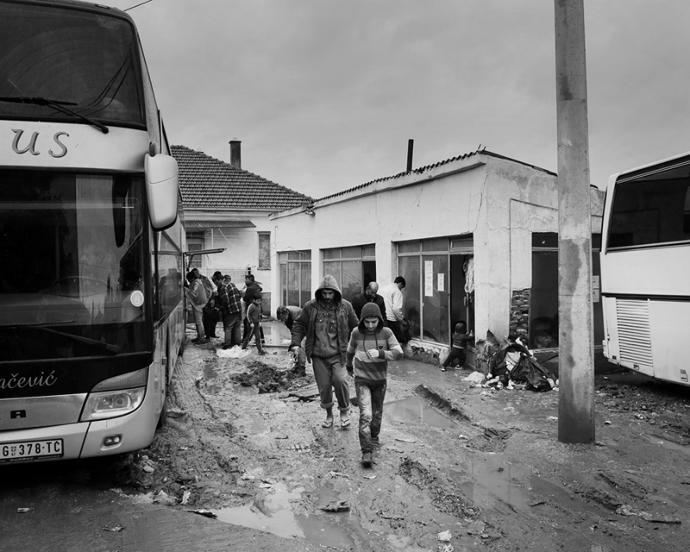 Serbia 8th Oct 2015 At the end of the street there are the buses that leave from Presevo travelling to Sid, taking refugees close to the Croatian border. Each refugee must pay 35 euros for a seat on the bus. Presevo, Pčinja. 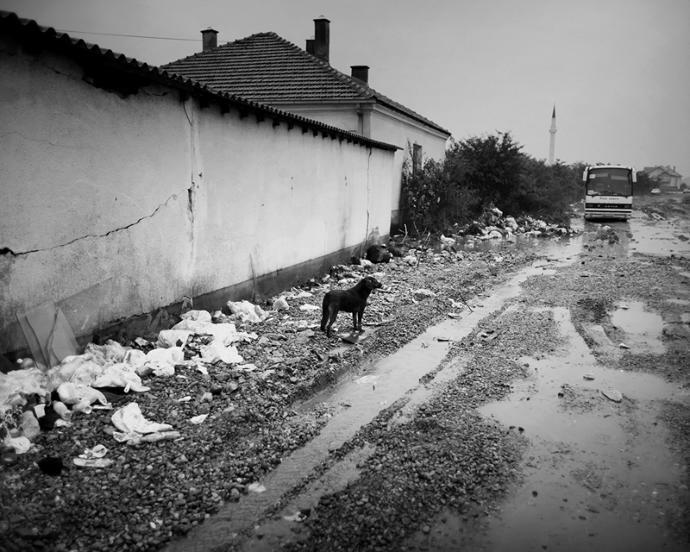 Serbia 7th Oct 2015 A stray dog in the mud and rain looking for food in the garbage, whilst another bus full of refugees departs for the croatian border.